According to the 1976 Bob Seger song of the same name, rock and roll never forgets. But the same can’t be said about the 73-year-old singer, who brought his “Roll Me Away: The Final Tour” to San Diego State University’s Viejas Arena. About 20 minutes into his set, Seger introduced a song and the band curiously remained quiet. Turning around to figure out why, he was informed that song was three more down the road. “Senior moment! What can I say?” quipped Seger, taking the gaff in stride while getting a laugh and applause from his adoring audience, a mostly over-50 crowd that could likely relate. The Detroit rocker kicked off the Feb. 21 concert with a spirited version of “Shakedown,” followed by “Still the Same,” from the 1978 album Stranger in Town, and “The Fire Down Below.” During these first few songs, the mix was a bit off and Seger’s voice wasn’t in front enough. Fortunately, by the time the silver-haired singer took a seat to play “Mainstreet,” punctuated by Alto Reed’s sultry sax, the sound was up to snuff. Seger is a fine storyteller, as his catalog of songs attest, but on this night he also did a nice job of sharing the stories behind many of his songs as he set them up — from “Fire Inside” (about his brief single days in LA) to “Like A Rock” (a song he wrote at 38, reminiscing about his super-fit high school years as a cross-country runner). And the veteran raconteur clearly enjoyed singing them, leaning back between verses, eyes closed and a euphoric smile on his face. Perhaps the most poignant moment came during “We’ve Got Tonight.” Seated at the piano, the singer-songwriter said this was his mother’s favorite song. As a result, he has played it every show since her 1989 passing. Seger’s heartfelt performance of the impassioned ballad drove the audience to sustained applause, and he was visibly touched by the reception. In addition to all the hits — from “Old Time Rock & Roll” to his first encore of “Against the Wind” and “Hollywood Nights” — Seger pleased the crowd with a pair of songs he said he hadn’t played live in upwards of 30 years: “You’ll Accomp’ny Me” and the silky smooth Rodney Crowell cover “Shame on the Moon,” which Seger took to No. 2 in 1983. Also unexpectedly, Seger performed Bob Dylan’s “Forever Young” as tribute to his longtime friend, late Eagles co-founder Glenn Frey, and other music icons who have passed since 2017, including Prince, Tom Petty, Aretha Franklin and Chuck Berry. During the performance, he showed images of the artists on big screens, many of the pictures also including Seger, a testament to their genuine friendship. 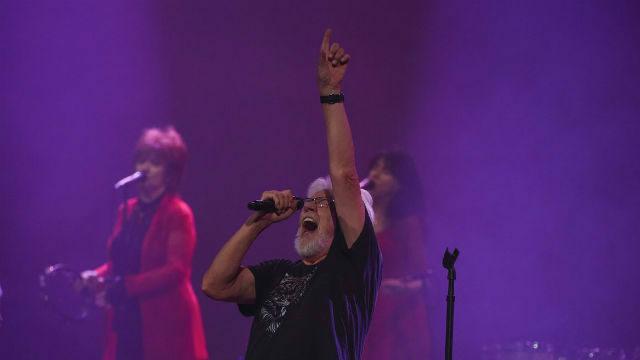 Seger’s stellar 14-piece Silver Bullet Band, which included three female back-up singers and a four-piece horn section, featured numerous longtime members, including bassist Chris Campbell (50 years) and the aforementioned Reed on sax (48 years). While each of them had moments to shine, this reviewer would be remiss if he didn’t at least acknowledge Rob McNelley’s exemplary guitar licks throughout the night. Seger hasn’t shared why he feels now is the time to say farewell, leaving many to speculate if it is health issues (he underwent back surgery in 2017) or if age has merely caught up with him (he did shout in places where he used to sing and occasionally sounded breathless between songs, but in general his gravelly voice was in good shape and these quibbles certainly didn’t detract from the overall performance). Fans can hope this isn’t the end of the road for Seger (maybe a Vegas residency is in order?) and perhaps find some solace in singing the refrain to his last song: Come back baby, rock and roll never forgets. Donovan Roche has covered the world of music for the past 30 years. Send your story idea to droche17@cox.net.